The Schuster maturing cellars are located on the Alsace side of the Vosges, in the village of Orbey, right in the heart of the AOP zone. For more than one century, ancestral skills have been handed down from one generation of the family to the next. In 1899 Joseph Ancel created his first maturing cellar. According to tradition he bought the fresh white cheeses from farmers, then carefully matured them for many weeks in his cellars, for sale throughout the region. His son-in-law Paul Schuster took over the business in 1920 and ran it until 1958 when he was succeeded by his son, Charles Schuster and his wife. 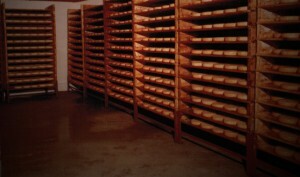 They created the company “Caves d’Affinage Schuster”, enlarged the premises and expanded the distribution network. In 1980, their son Jacques Schuster joined the company and decided in turn to follow in the footsteps of his ancestors. Assisted by his wife, in 1992 he took over as head of the company in order to perpetuate its traditional skills. Respecting the ancestral traditions of the craft of maturing cheese lies behind the successful development of this family firm over the years.